Home \ Showbiz News \ Jean-Luc Picard Is Back! 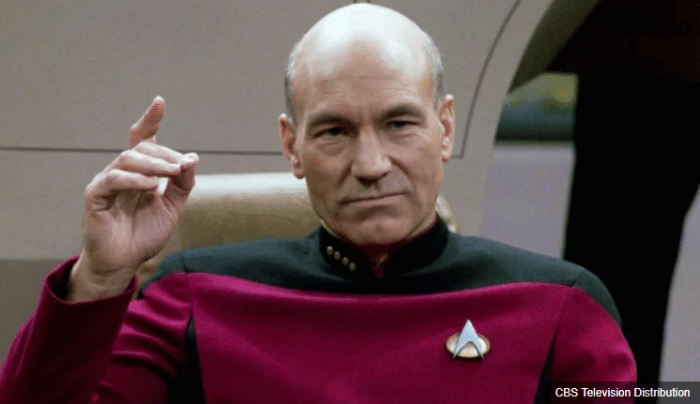 Patrick Stewart has officially announced the return of the ‘Star Trek: The Next Generation’ captain. The crowd was not expecting this. Thousands of Trekkies (or Trekkers, depending on your personal belief system) gathered in the Leonard Nimoy Theater at the annual Star Trek Las Vegas convention held by Creation Entertainment. William Shatner had just left the stage, having delivered his usual round of self-deprecating Q&As, but we were urged to remain in our seats. I had heard earlier that Alex Kurtzman was going to follow the marquee event with a special announcement but had assumed it would just involve information regarding the second season of Star Trek: Discovery or the home release date for the first (that news would come later the next day). Kurtzman said, “I figured that this was probably the day to announce to you what our next Star Trek series is going to be. If that’s okay with you guys.” A healthy applause spilled forth from the audience, but then he continued, “But I actually don’t feel entirely qualified to be the one to do it. So what I would like to do is bring out a good friend to talk about the next one.” Behind him, a re-creation of the Enterprise-D’s bridge doors opened and Patrick Stewart walked out onto the stage. The room erupted. As was the case for every actor who took that stage this past weekend, Stewart is in awe of the power this franchise has on those who get swept up in it. Star Trek is the future as it should be. I’ve never heard a crowd as loud. I honestly felt the room move. Some stranger behind me fell upon my shoulders in exaltation. The reaction was absurd and beautiful. It will be, I promise you, I guarantee it, something very, very different. It will come to you with the same passion, and determination, and love of the material and love of our followers and our fans, exactly as we had it before. This new Star Trek show is still in the very early stages of development. We do not know if it will be an ongoing series or have a limited run. Deadline is reporting that several Star Trek: Discovery team members will be jumping ship for the Picard spinoff. James Duff (Discovery Executive Producer), Akiva Goldsman (Discoveryproducer/writer), and Kirsten Beyer (Discovery writer/novelist) are all tapped for the creative board. As is Pulitzer Prize-winning author Michael Chabon, who also wrote one of the Star Trek: Short Treks installments to be released in December.